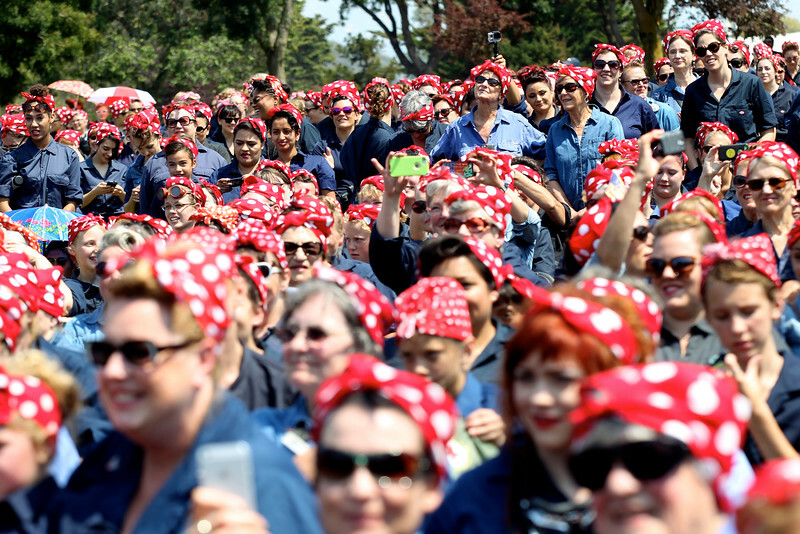 Thousands gather for the annual Rosie Rally at the Rosie the Riveter/WWII Home Front Historical Park in Richmond, CA. 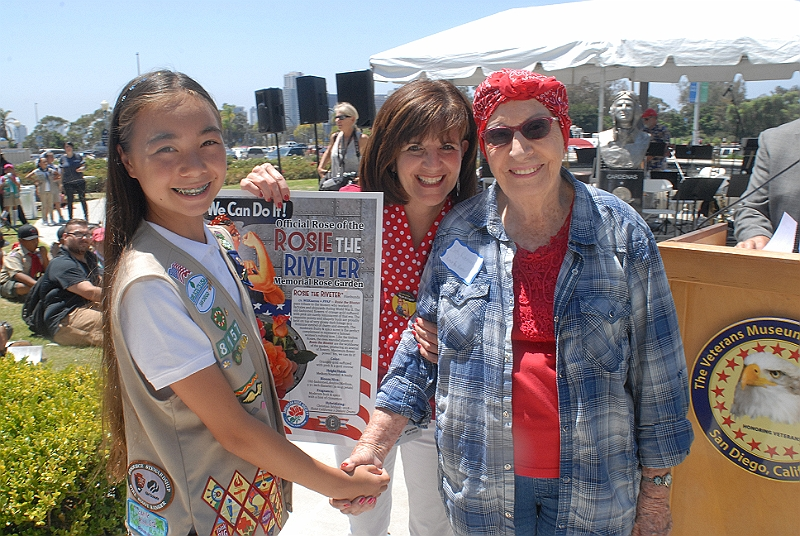 Girl Scouts planting Rosie the Riveter Memorial Rose Gardens across America. 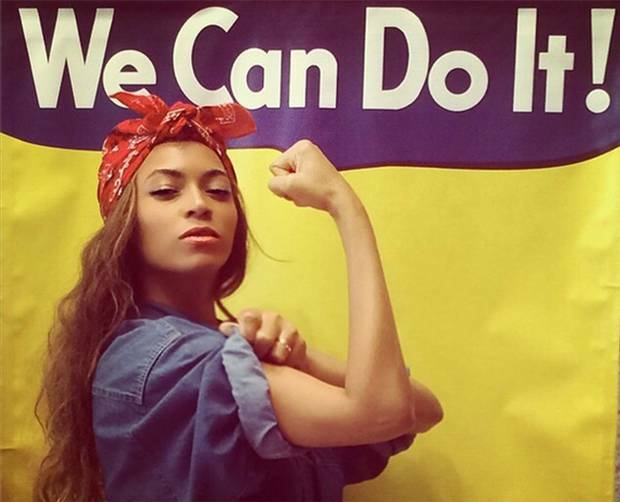 "Remember the Rosie the Riveter!" 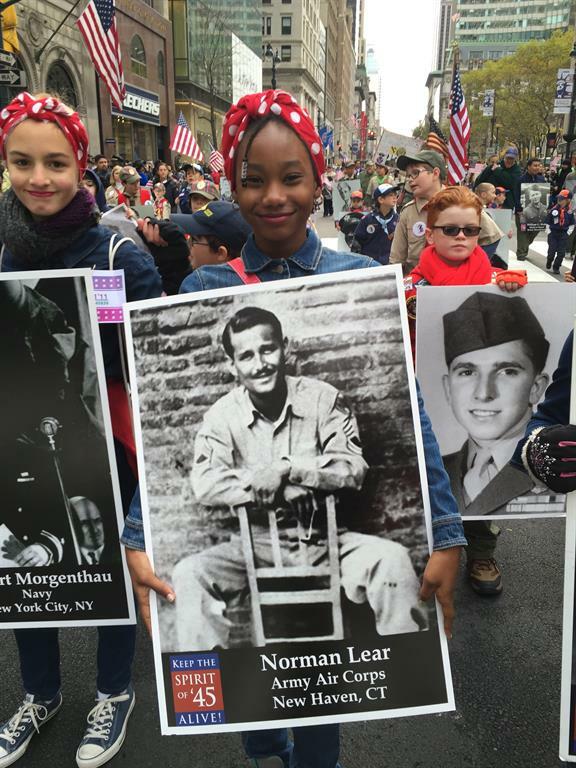 women who worked on the Home Front during World War II. 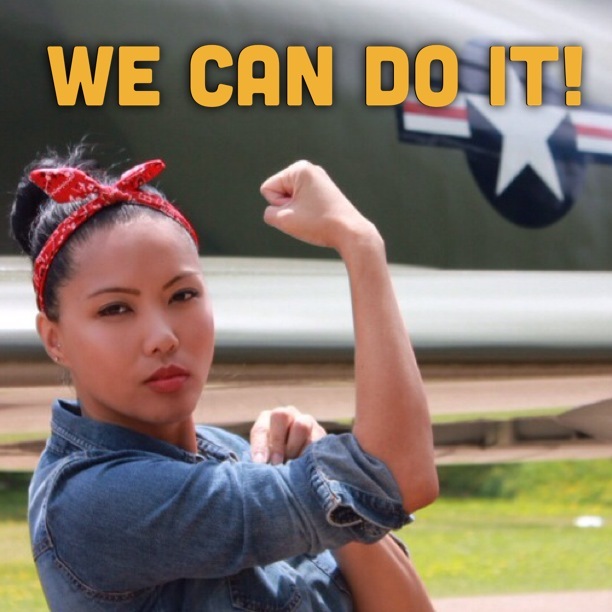 across the country and help build a permanent "living memorial"
by planting Rosie the Riveter Memorial Rose Gardens. Learn more about the campaign! 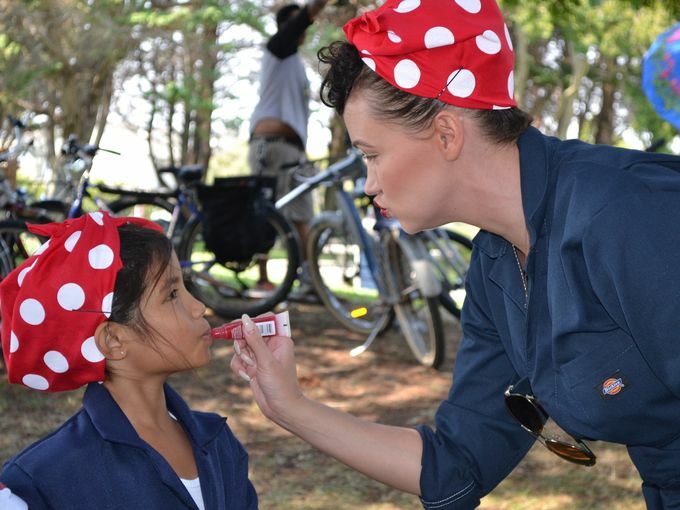 Register your Rosie Rose Garden location here! so they can be added to this year's Rally Gallery! now in 18 states and counting! 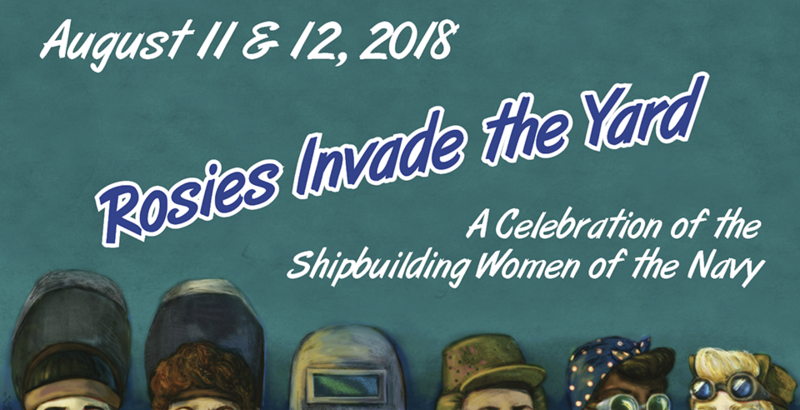 Take this opportunity to plant Rosie the Riveter Roses in your community and register your Garden as part of the national living memorial. 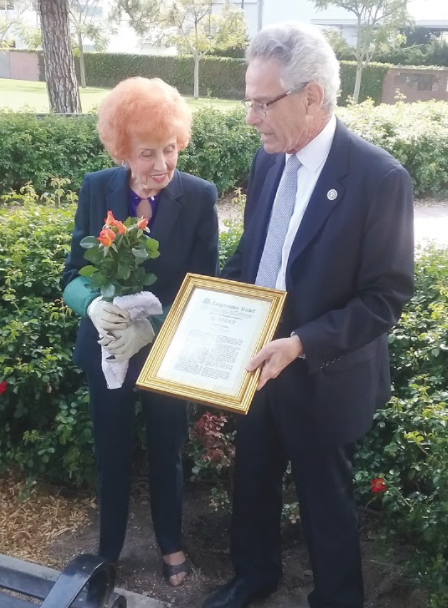 Elinor with Girl Scout at Glenn L. Martin Aviation Museum in Baltimore, receiving key to the City of Morris Plains, NJ, with legendary TV and film writer & producer Norman Lear in Beverly Hills, dedicating Rosie Rose Garden at March Air Field Museum in Riverside, CA, with Boeing EVP Leanne Caret in Washington, D.C.
(L) Elinor Otto receives National Rosie the Riveter Day proclamation from Congressman Lowenthal. 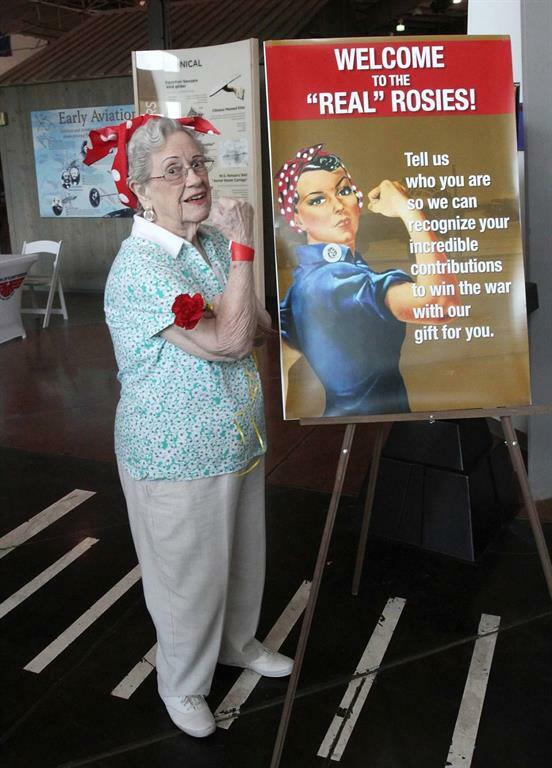 (C) Newly created Spirit of '45 Rosie the Riveter Rose. 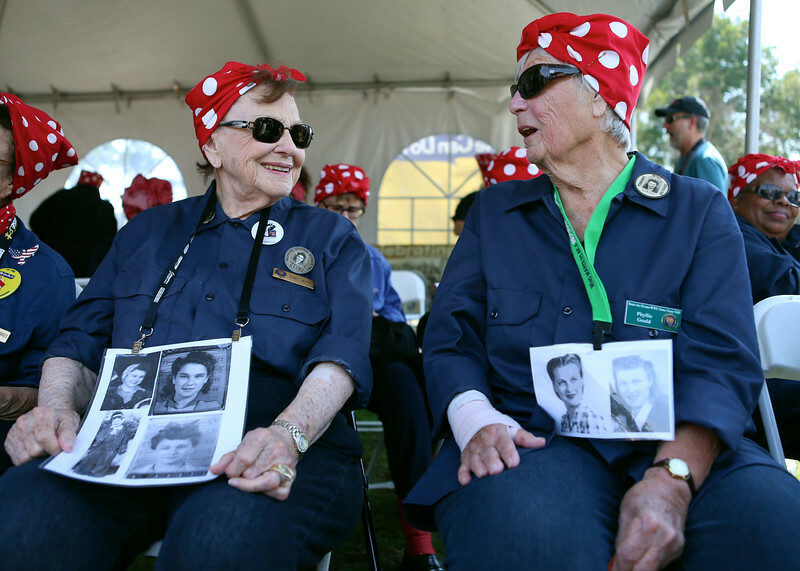 (R)Elinor breaks ground the first public Rosie the Riveter Rose Garden in Long Beach, CA. 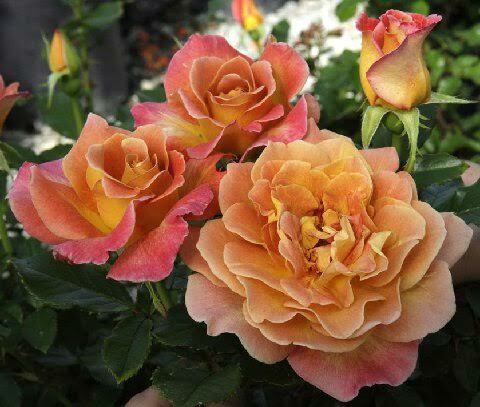 and expanded to include more than a dozen Rosie Rose bushes in 2018. 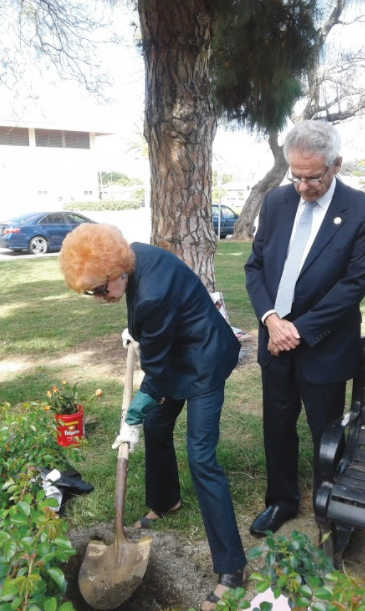 Elinor Otto of Long Beach, CA, is leading the national campaign to create a "living memorial"
of Rosie the Riveter Memorial Rose Gardens in communities throughout America. 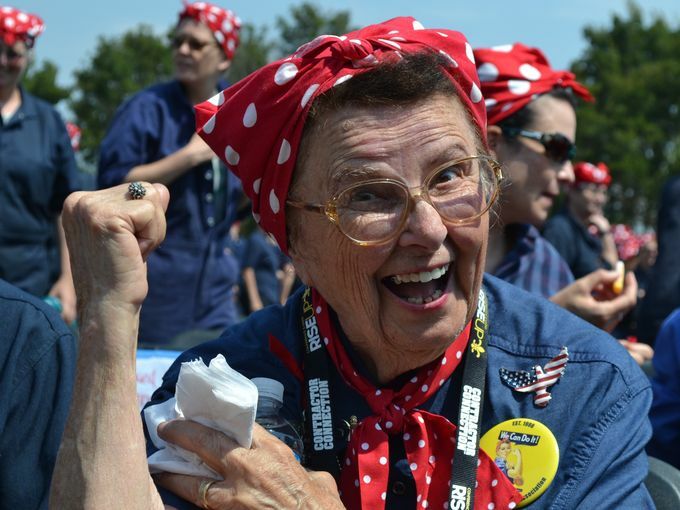 the international commemoration of the 75th anniversary of the end of WWII in 2020.
earning her the title of "America's Longest Working Rosie." 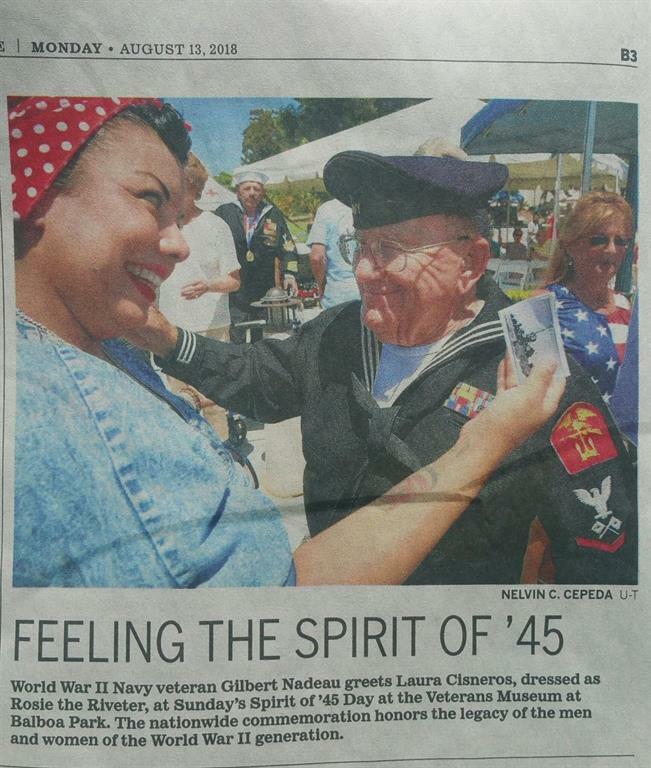 Elinor has been a SPIRIT OF '45 national spokeswoman since 2010. 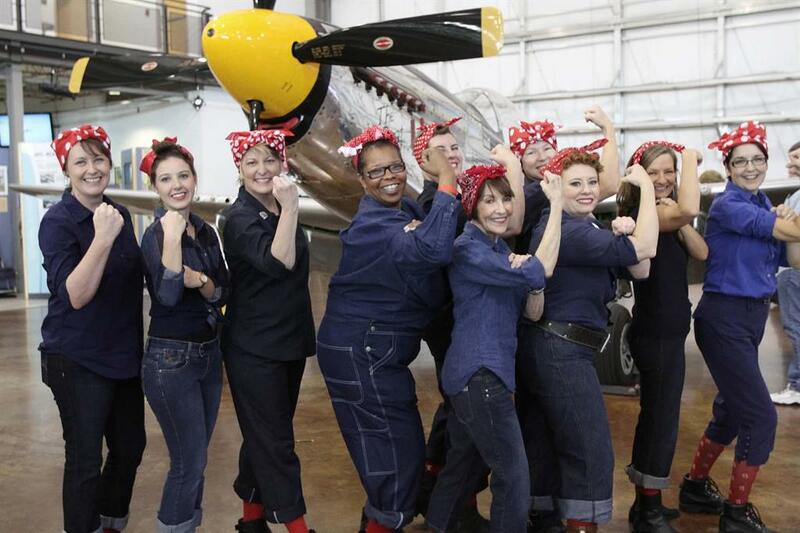 Original Rosie's with Seward Johnson sculpture which was displayed at the Harry S. Truman Presidential Library in Kansas City, MO during the American Rosie the Riveter Association national convention in June 2017. 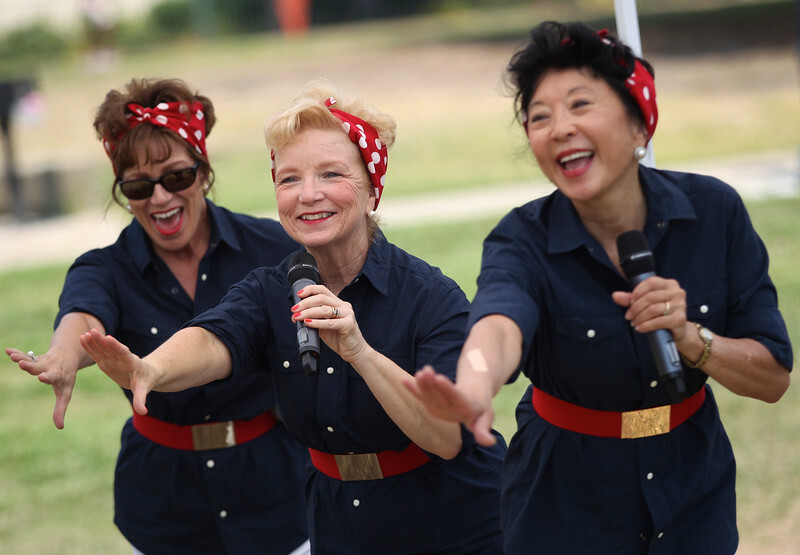 The first annual "Rally for the Rosie's" in August 2015 was an outstanding success, with thousands of Rosie the Riveters and Rosie lookalikes ages 1 to 101 gathering in locations throughout the country to celebrate the legacy of the women who served on the Home Front during World War II. Richmond Rosie Rally sets World Record! 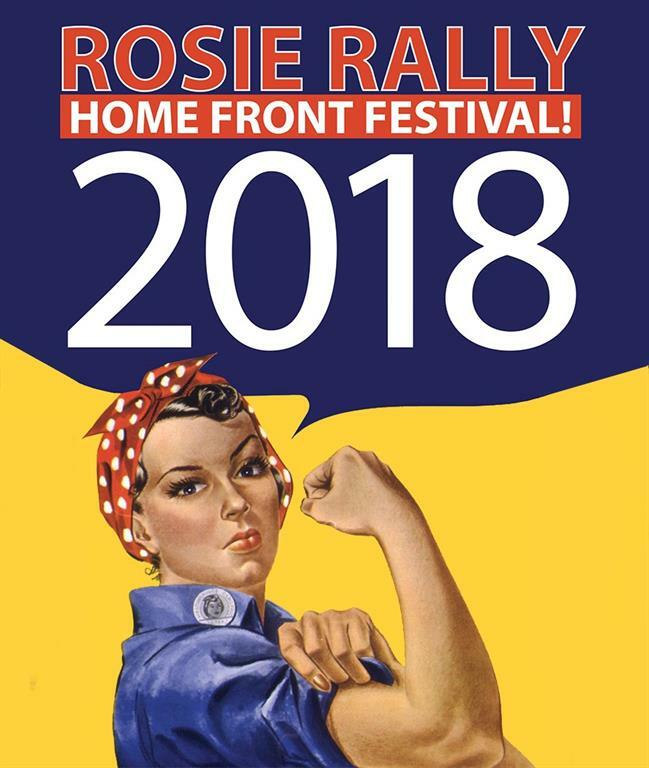 The core theme of the "Rally" was to remind America of the transformational role the Rosie's played in laying the foundations for greater opportunities for women. 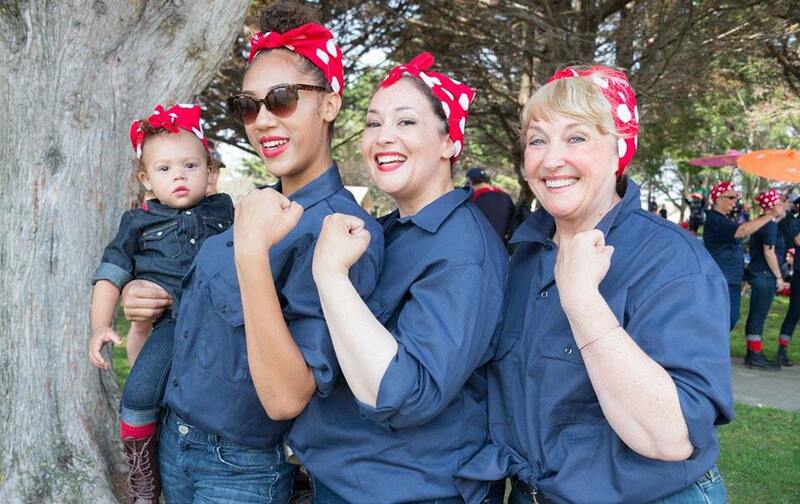 The nationwide "Rally" was led by the National Park Service, which set a Guinness World Record for the largest gathering of Rosie lookalikes in history, with more than 1,000 women of all ages coming together at the Rosie the Riveter Memorial Park in Richmond, CA on Saturday, August 15. 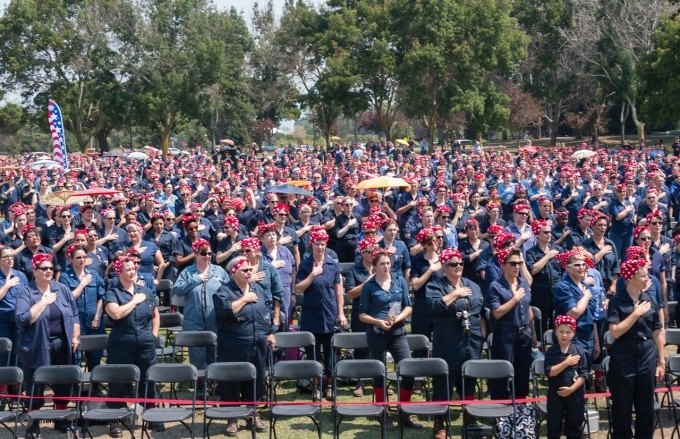 Rosie Rally a big success! 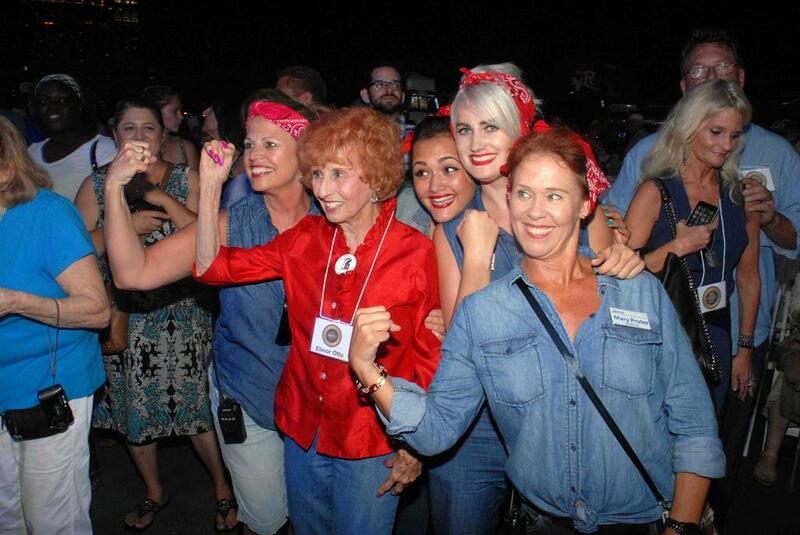 Video of biggest gathering of "Rosie's" in history! 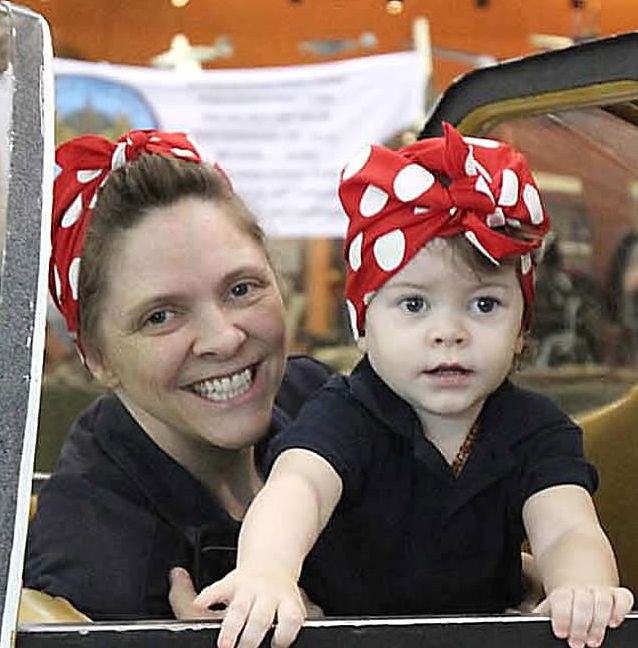 Rosie Rallies were held at other locations around the country, including the Yankee Air Museum, where the concept first originated when nearly 800 Rosie and Rosie lookalikes gathered last year to help raise funds to save the Ford Willow Run Bomber Plant. 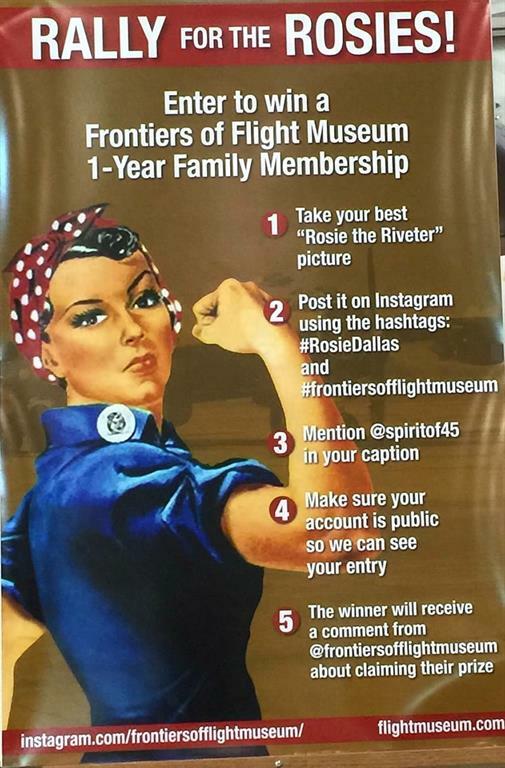 The Frontiers of Flight Museum in Dallas, TX also included a Rosie Rally as part of its two-day Spirit of '45 70th Anniversary Commemoration Weekend event on August 15 -16. 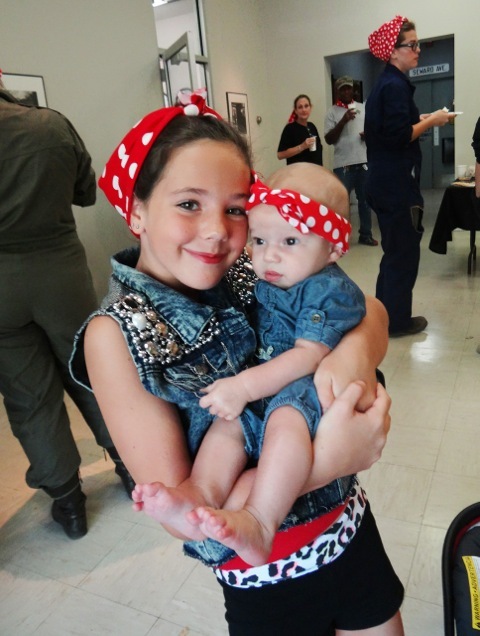 Individual "Rosie" lookalikes of all ages appeared at other events throughout America in a nationwide show of solidarity for continued progress toward full participation and equality for women. 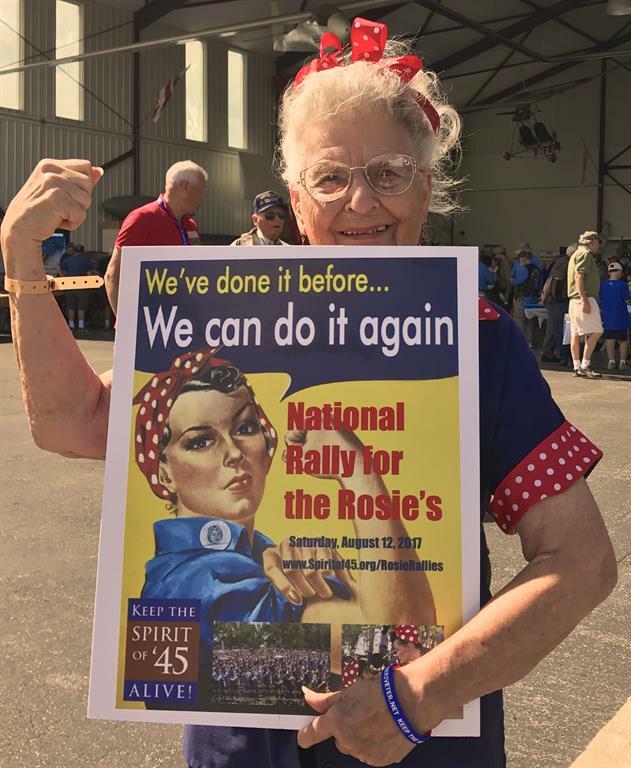 A highlight of the 2015 Rally was a special guest appearance by Spirit of '45 national spokeswoman Elinor Otto, 95, "America's longest working Rosie." 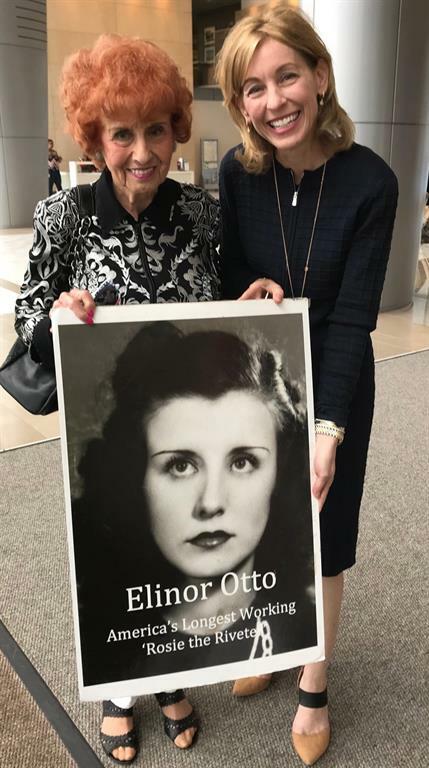 Ms Otto has been making public appearances during the past five years to help raise awareness about Spirit of '45 Day the contributions of women during WWII and speaking to young women's leadership groups. 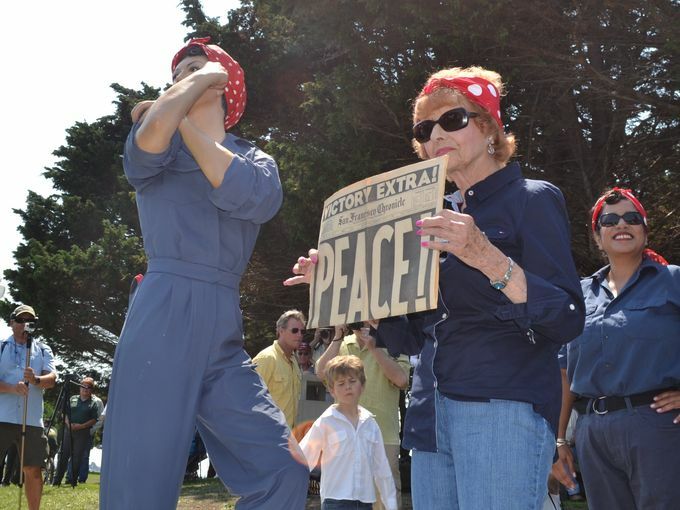 Elinor helped unveil a new sculpture by acclaimed artist Seward Johnson depicting the famous "Rosie Pose." 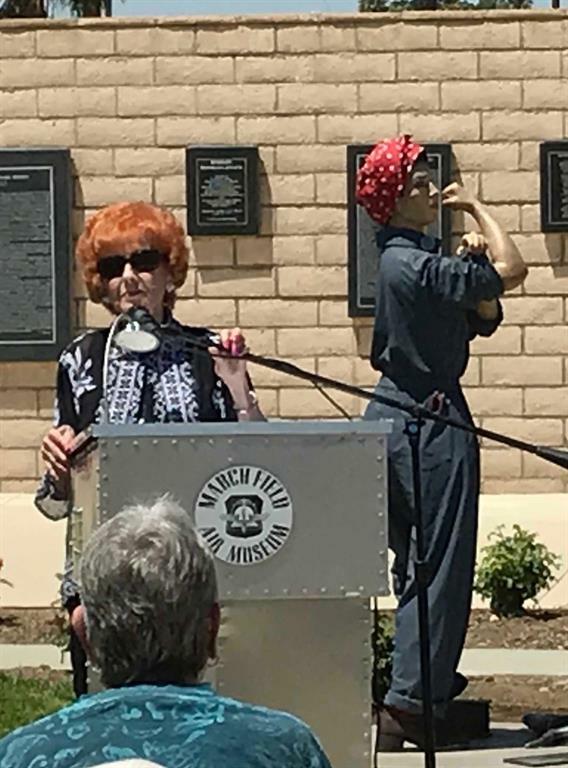 The sculpture is on loan to the Rosie the Riveter/Home Front Historical Park during the National Park Service's upcoming centennial when it will go on a national tour. Elinor was flown up to Richmond for the NPS Rally by Southwest Airlines, courtesy of the USS Midway who hosted her as a special guest at their big event in San Diego that evening. 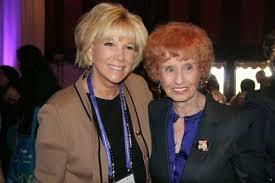 Elinor with Joan Lunden and as a young Rosie when she began her career building aircraft in 1942. 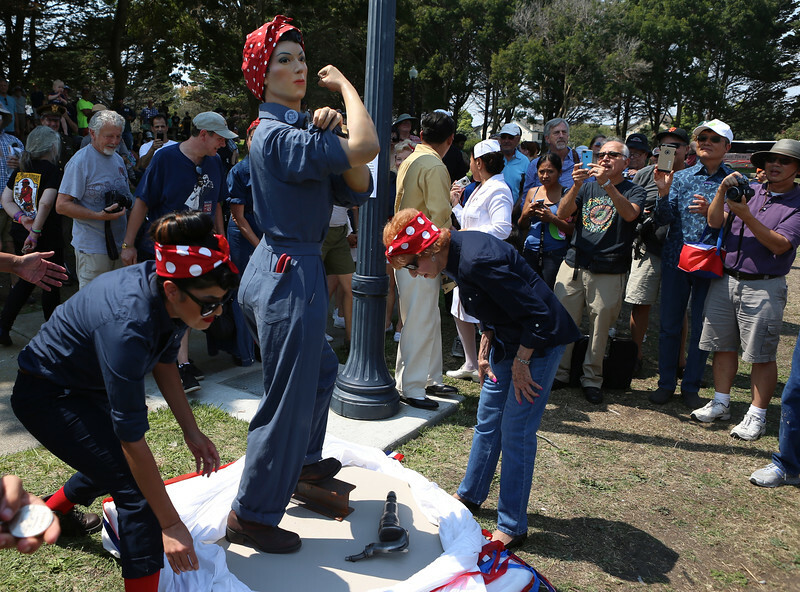 The Rosie the Riveter Memorial in Wood-ridge, NJ is the only memorial in the US that incorporates the iconic image of a Rosie holding a rivet gun. The Memorial was created by New Jersey based artist John Giannotti, and was commissioned by Somerset Development, New Jersey Transit and the New Jersey State Council of the Arts. 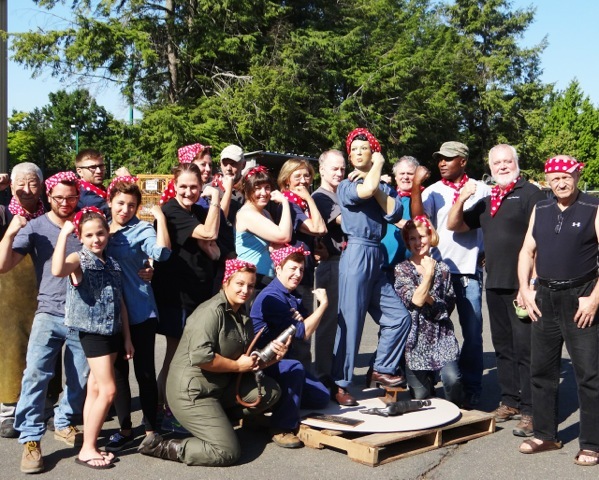 "The Rosie the Riveter monument I created for Wood-Ridge, New Jersey, at a site adjacent to the WWII Curtiss Wright manufacturing plant where 9,000 “Rosies” worked, was inspired by multiple sources and images. "Of course, I studied the iconic poster that J. Howard Miller created in 1943, as well as the Michelangelo-inspired Saturday Evening Post cover painted by Norman Rockwell. 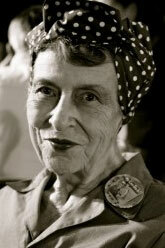 But I was more interested in the everyday Rosie, not the heroic ones envisioned by Miller and Rockwell. 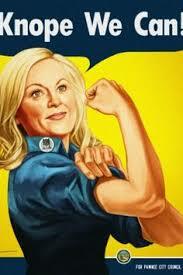 "So I dug into historical archives to find images of real Rosies at work. I decided to show Rosie AFTER one of her work periods, about to take a lunch break. Her rivet gun is held at rest, waist high, and close by is a still life of a full Coke bottle and lunch pail on which her name is imprinted. "This “still life” is resting on a granite cube which contains etchings of real Rosies as well as the Curtiss Wright logo and a short history. 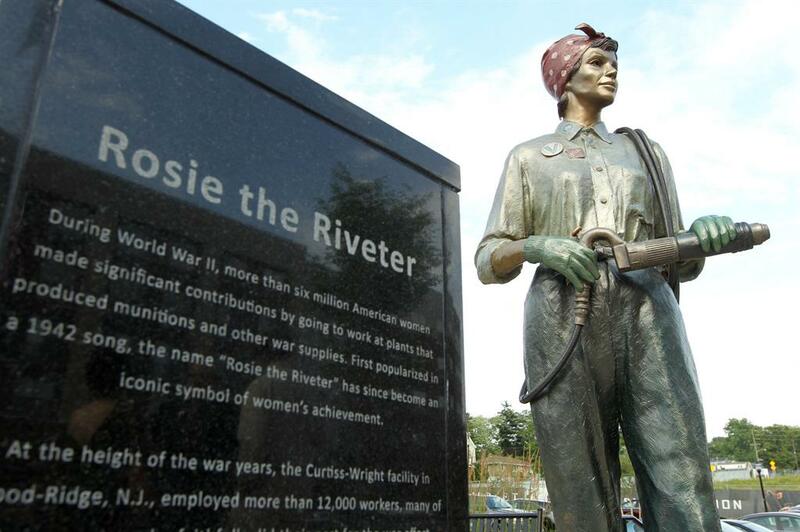 The pneumatic hose that powers her work is suspended from the rivet gun and is attached, at the other end, to the granite block just under the Curtiss Wright logo and the Rosie images. "This connection, for me, symbolically relates this particular Rosie to others who worked with her — those thousands from whom she received her own power." 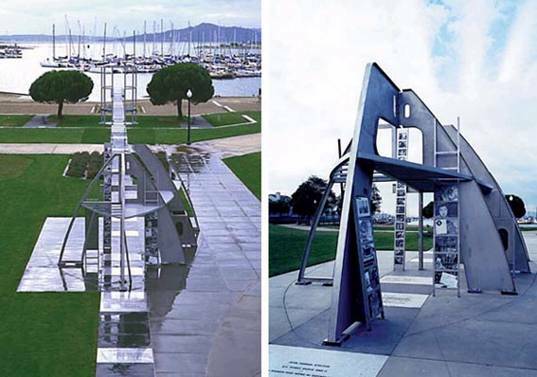 Rosie the Riveter Memorial in Richmond, CA across the Bay from San Francisco, CA. 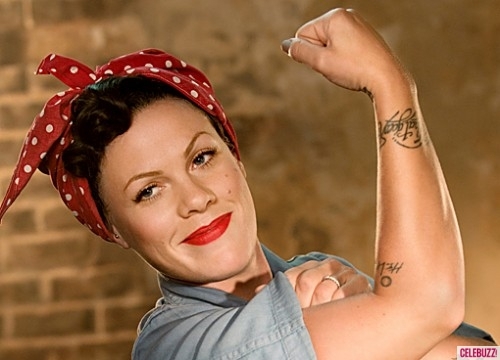 Pink, Christina Aguilera and Amy Poehler have the Rosie Spirit! On June 26, 1945, future US President then Capt. 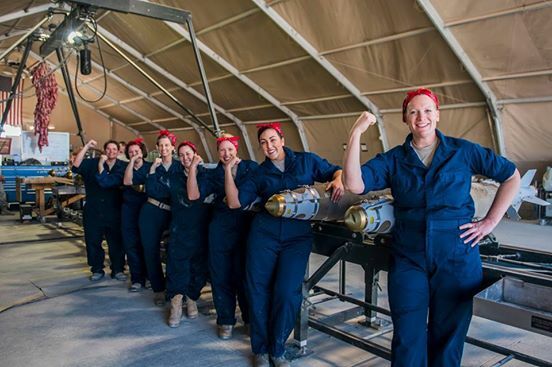 Ronald Reagan of the U.S. Army’s 1st Motion Picture Unit ordered Army photographer David Conover to photograph women working in defense plants. 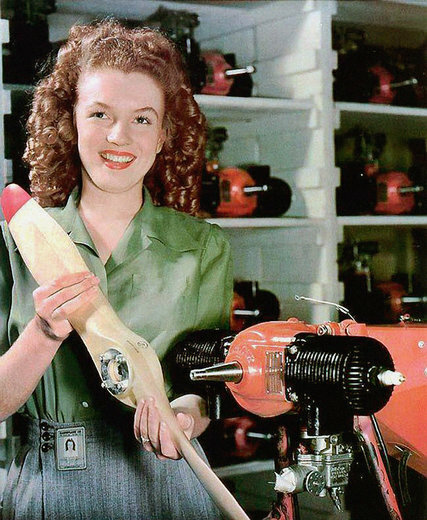 Conover later wrote about his experience meeting Norma Jeane. "I moved down the assembly line, taking shots of the most attractive employees. None was especially out of the ordinary. I came to a pretty girl putting on propellers and raised the camera to my eye. She had curly ash blond hair and her face was smudged with dirt. I snapped her picture and walked on. Then I stopped, stunned. 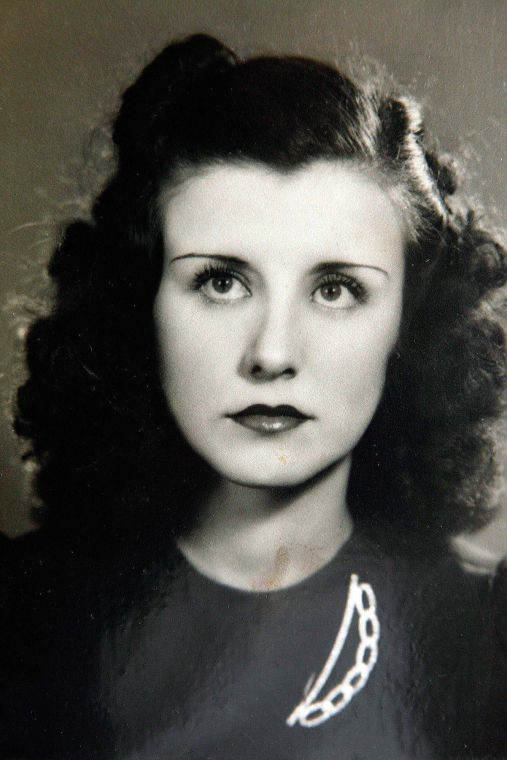 She was beautiful. Half child, half woman, her eyes held something that touched and intrigued me..."